Firstly, If you are going to take out a meal plan and you want to save money then check out DLP Guide for plenty of information, but most importantly all the menus so you can make a decision on the places you would like to eat and find the best plan for you. Next up head over to their Meal Plan page to work out which meal plans most of your restaurants fit into (remember you can top up if needed, as I will mention later in the post!). As a rough guide, the Hotel Plan is great if you just want to eat in your Hotel, the Half Board is fantastic if you just want to have Buffets, The Plus is great If you like Sit Down Meals and the Premium only really saves you Money if you want to dine in Interventions (posh character dining buffet) or Auberge de Cendrillon (Princess Dining) every single day! (Cafe Mickey Lunch/Dinner which is also characters is included in the Plus plan!). The last thing you need to do is decide whether you would like 2 meals a day (Half Board – Breakfast AND Lunch/Dinner) or 3 (Full Board – Breakfast AND Lunch and Dinner). For us the Full Board is a waste, we just don’t have time to eat 3 meals a day at Disney!! 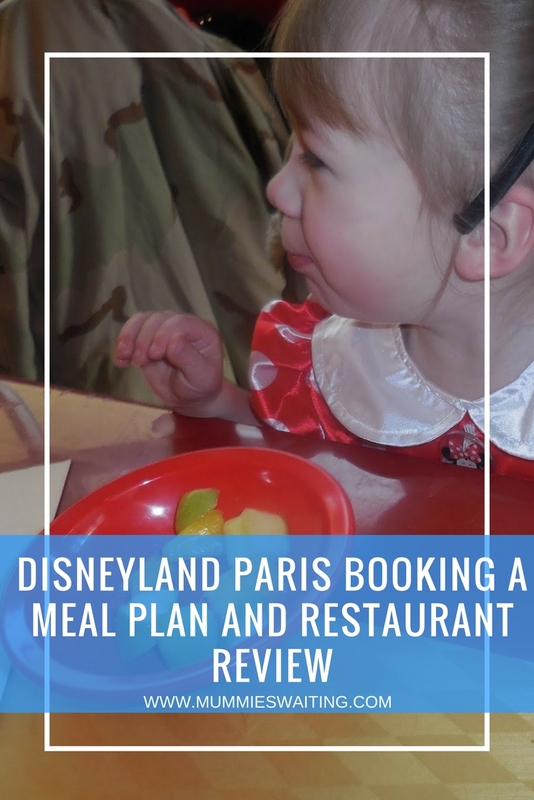 So after discussing where we would like to eat (Café Mickey, Auberge de Cendrillon, Blue Lagoon and Bistro Chez Rémy) we booked Disney’s Half Board Plus Meal Plan and rang 60 days before our trip to book our restaurants. Each Half Board Plus (the plan we chose) voucher entitles you to a Starter, Main, Dessert and a soft drink, usually off a set menu and every sit down restaurant will serve you bread rolls while waiting for your food (At ADC these are exchanged for cheese puffs). On our first and final nights, we used our Half Board Plus Vouchers to go back to the Blue Lagoon (I say back because we visited for the first time last year and it was amazing!). Blue Lagoon is the restaurant inside the ‘Pirates of the Caribbean’ Ride. Its set in the first scene as you get on the boat. The restaurant theme is fantastic and you get a chance to sit buy the ‘river’ and watch the boats and riders pass (The great thing is that you are close enough to enjoy the rides, but far enough away that you don’t feel they are dining with you!). We entered the waiting area and approached reservation desk, which is next to a beautiful open fire, I told the lady my name and she asked us to walk through to the main area. A waiter attended us as soon as we walked in, seated us at our table (The first night we were right next to the river, where I had always wanted to sit!) handed us our Caribbean Themed Menu (our vouchers gave us the ocean treasure menu) and gave us time to have a look. After enjoying our meals last year, we were quick to order. Ryan Ordered the Fish (Including Shellfish) Soup – Which was served with Curry Bread and condiments. On Thursday I ordered the Caribbean Salad – Romaine lettuce, avocado, pineapple, kidney beans, baby corn, cucumber, cherry tomatoes and mango vinaigrette. Ryan ordered the Crayfish and scallop ravioli for his main – which arrived with marinated peppers and a shellfish coulis. I choose the Caribbean chicken colombo – served with fragrant rice and roasted plantain. For dessert the girls were given a chocolate mouse – which had popping candy on the top. Myself and Ryan both ordered the Mango Delight for dessert both nights – which came with (soft and unexpected) gingerbread, raspberry coulis, cream and a type of ‘cheesecake’. Our Food came out fast and with a smile. It was very well presented with condiments that would usually be in bowls instead in ‘bowls’ that had been hand crafted out of leaves and everything had that extra touch like the drizzle of raspberry coulis. Ryan told me his Ravioli was the best ever and could definitely eat the Fragrant Rice, Plantain and ‘Gingerbread’ again (Honestly I could eat that meal every day and not get bored!) The girls ate theirs all up and by the looks of it, it was their most favourite meal of the holiday. As a trial on the first night, we also ordered a ‘baby chef kit’ – a meal for children 1-3, however when it turned up, it was puree so we gave up on this idea and the girls shared ours! With the Baby Chef kit also came a free dessert – Ice cream topped with sauce and chocolate ‘Smarties’. Overall the meal was a success, we’ve been 3 times now and of course it’s on my list for next trip! Café Mickey was the best place for children that we ate in all holiday. The characters were all great and came round at intervals so you had time to eat in between and the food was really nice. If you are staying at a hotel that doesn’t include a hot breakfast then Café Mickey is worth every penny! From Sausages, Scrambled egg and beans to toast, yogurt and croissants there is something to suit everyone. You are seated at your table and then can go up as many times as you wish. Bristo Chez Remy was next on the menu, the restaurant is well set out with so many of those little Disney touches that we all know and love. Again we decided it was best to order a kids meal, this was a fantastic decision because the girls ate all the food up and really enjoyed it! For the girl’s starter, they shared a salad of mozzarella balls and cherry tomatoes with breadsticks. For the girls main they shared a Skewer of beef meatballs, homemade ratatouille and French fries. For the girls desert, they had Remy’s chocolate and hazelnut éclair. Ryan chose the Apple Tartlet. and I’m sure mine was Brie de Meaux (Rothschild Estate – Trente Arpents Farm) with vine peach jelly and fruit bread. As it rained all day on Wednesday, we got a last minute spot in ADC (Princess Dining!). Unfortunately, this was by far the least favorite meal of the trip. The food wasn’t really child-friendly at all and it wasn’t the WOW that we were expecting as adults either! The princesses were nice, but for the price, you don’t really get much time with them and due to the servers rushing about our children were misses out when they got the kids up to see the princesses dancing. However, the food was presented really well and the service was good. Upon being seated we were all given a non-alcoholic cocktail and a plate of cheese puffs to share. Fairy Bites (Salad) was the children’s starter. Myself and Ryan both decided on the Soup which was incased in a bread top! For Desert, Kairi received Cinderella’s Slipper. We left early because we really didn’t enjoy this meal, we had to top up by nearly £100 and felt like it was a total waste of money! The Pause Gormende came in really handy throughout our trip. We would use it early every day (around 3pm) to tie us over from breakfast to dinner. PG can be redeemed between 3pm and 6pm (at certain food outlets) Each voucher entitles you to a hot or cold drink and either a magnum or doughnut. When checking our receipts we had saved roughly 12 Euros for 2 of us, that is nearly 25 for a family of 4! Earl Of Sandwich is one of my most favorite places to eat in Disney, the sandwiches taste amazing and are great value for money. Not forgetting always ending off with a brownie! Mc Donald’s is a good deal if you want a quick snack and can be great to grab for an early morning treat if you’ve missed breakfast! Caseys Corner is again a really nice treat to have, the hot dogs are amazing and totally worth every penny! Although it’s on the more expensive snack end, it’s more of a lunch. The hotel breakfast is very simple, there is fresh fruit, toast, croissants and cereal. You can make a hot drink or have water, fresh orange and apple juice. Its very basic but unlikely different to what you would have at home. It gets very very busy, so its best to rush down as early as you can and then make the most of the extra magic hours or you could be queuing for at least 45 mins! If you have a favorite place to eat that I have tried or you have any questions, let me know in the comments below! If you are interested in more Disney posts then head on over to our Disney with kids! Section of the blog or Check out our Youtube channel!